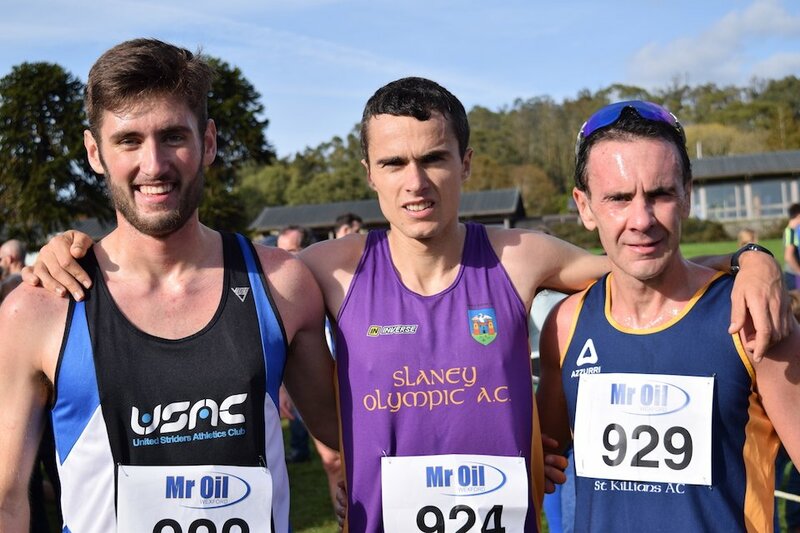 The Mr Oil Wexford Senior Cross Country took place last Sunday, along with the second day of the Juvenile Championships, in the stunning setting that is JFK Park & Arboretum. Indeed there is probably not a better time to visit the park as, with the leaves turning, the whole place is a riot of colour. 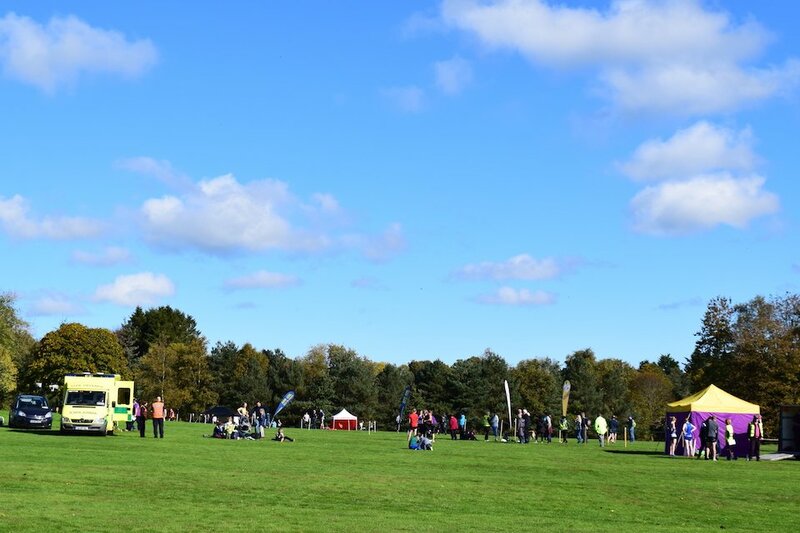 The fact that the torrential rain of the previous day was replaced by glorious Autumn sunshine only added to the experience. As a result of Saturday’s heavy rainfall there were more than a few athletes who came equipped with 15mm spikes. They need not have bothered as underfoot conditions were firm throughout. 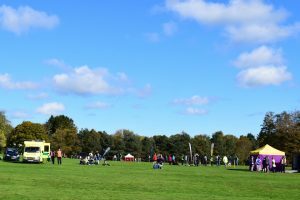 Host club United Striders put a good deal of thought into designing a course that combined undulating parkland with twisting woodland trails, and gentle but testing uphill stretches with long-striding descents. A large field assembled for the women’s 5km race. From the gun it was clear that Kilmore’s Fiona Kehoe was happy to run her own race as she took off from the rest of the field. Her clubmate Jackie Carty was the only one tempted to stick with Fiona’s hot pace with the DMP duo of Ann Sullivan and Katie Wilson and Enniscorthy’s Emily Waldron, a little further back. For the first two laps of the smaller 1100m circuit, Jackie kept the gap between Fiona and herself at just about manageable levels. However, on the final 2800m lap, with its loops and energy-sapping ascents, Jackie slipped back a little and Fiona extended her lead, going on to record a comfortable win. Ann Sullivan, who had only herself for company for the latter half of the race, having pulled away from clubmate Mary Sinnott, took the Bronze ahead of another DMP runner, Katie Wilson, in 4th place. Mary, having run a brave and gutsy race, suffered in the latter stages and slipped a couple of places to finish in 7th. She still came away with a Gold team medal as, with Christine Stone in 12th place, the club, on 26 points took the team title. In the process they caused something of a sensation by de-throning long-time champions Kilmore (31 points). 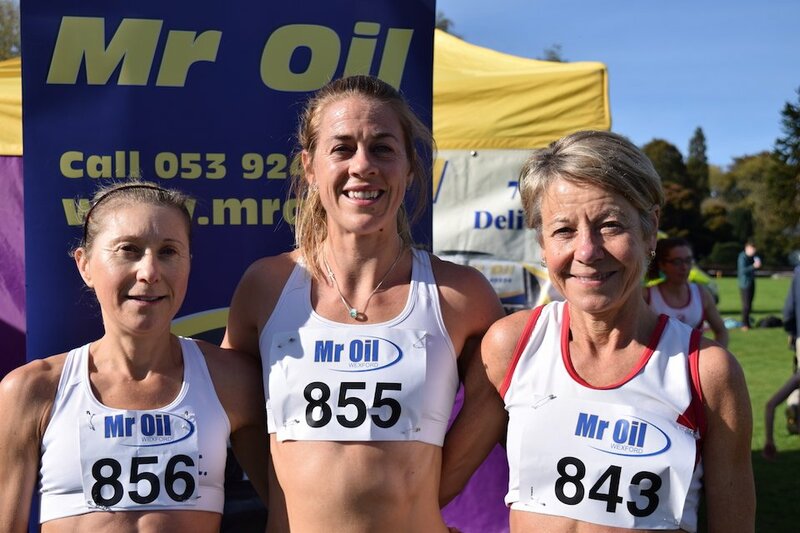 DMP had feared this feat was beyond them as they were missing Ciara Wilson, one of their star athletes as she is presently focusing on next weekend’s European Duathlon in Ibiza. SBR took the Bronze with 46 points. Link to full results (provisional). The Senior Men’s 10000m race saw Ger Forde of Slaney Olympic reclaiming the title he won last year in such emphatic style. This year, however, he had young United Striders athlete Aedan Rogers to contend with. Having moved mid-race past the vastly experienced Niall Sheil (St Killian’s), Aedan, still a Junior, looked full of running and self-belief. Forde had enough in reserve to stop the Striders lad getting too close and, at the finish line had 18 seconds to spare. Niall Sheil took the Bronze. The team competition was always going to be a close affair. SBR were aiming for nine in a row; United Striders had other ideas. With a lap to go it began to look like Striders might be about to cause a big upset as they had a few points to spare on their rivals. Then word filtered through that Alan O’Connor of Striders had been forced to retire from the race. Disaster! And yet, was it? Race over, the number crunching began in earnest as both clubs milled around waiting for a result. Finally, it came: United Striders 58 points, SBR 57 points. SBR retain their title for another year by the narrowest of margins. SBR’s scoring six: Paul Lynch (5), Pedro Calvo (7), Denis Moynihan (8), Noel Kennedy (10), Myles Gibbons (13), Paul Gibbons (14). United Striders scoring six: Aedan Rogers (2), Brendan Lyng (4), John McGrath (6), Paul Doran (12), George Delaney (15), Sean Murphy (19). SBR’s B team took the Bronze (153); Slaney Olympic placed 4th (159) and Croghan were 5th (163). Link to full results (provisional). Tagged JFK Park, United Striders, Wexford Senior Cross Country Championships. Bookmark the permalink.